This week on Spellburn, we have a special guest for just in time for “Fangsgiving.” Our summon patron spell went awry and opened a portal to an alternate universe… a new world of gods and monsters! 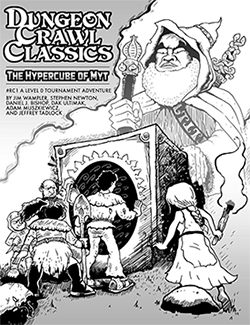 Tonight we’re interviewing one of our most requested guests – Scott Mathis, the creator and publisher of the latest Dungeon Crawl Classics RPG supplement, Transylvania Adventures! And don’t forget to check out this week’s winning entry in our Dungeon Denizens contest! Please let Scott know that I don’t have a favourite class as of yet; as a player, I like to dabble in various classes. The Valiant seems, to me, to be a really good place to start, though, and is THE iconic Gothic horror staple. TA contains a lot of cool ideas. Now we need Scott to do an “actual play” podcast…..
Been lurking a while, but wanted to chime in today. It was great to hear from Scott about Transylvanian Adventures. Definitely want to check that out. What a fantastic day! New Spellburn episode with an excellent interview, followed up by winning this weeks Dungeon Denizen. Thanks guys! Jim your picture for my gnarled creation is fantastic! I was not that interested in Transylvanian adventures until a heard this episode. Scott’s description and passion for the setting was very apparent. I will be picking up a copy! Thanks for the great episode. Look forward to the next. Great episode- another interesting guest and very informative discussion. Spellburn remains one of highlights of my week! It would be great to hear something similar for Fallen Empire when that product comes on line! We had Tales From the Fallen Empire author James Carpio scheduled as a guest and the recording session fell through. We’ll definitely be having him on the show as soon as the schooling gods align. This podcast got me intrigued enough to go ahead and buy it from Drivethru with Hardback (+PDF) so I could start checking it out NOW!